Welcome to a playground teeming with monsters, bristling with energy and conjuring up hairy ways to have fun. Monsters swing and slide and piggy-back ride. Monsters run three-legged races and fall on their faces. Monsters eat monster lollipops and tussle for the fountain (Gulp...... read full description below. Those little monsters are back - and on the move! 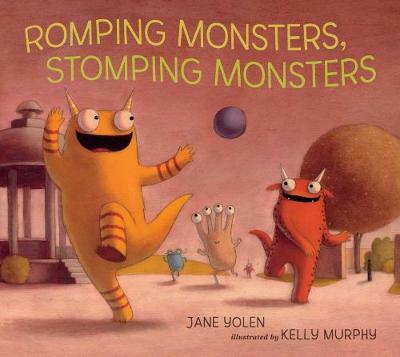 Jane Yolen takes her rhymes to the playground, aided by Kelly Murphy's exuberant illustrations. Stretching, twirling, tumbling, jumping! Welcome to a playground teeming with monsters, bristling with energy and conjuring up hairy ways to have fun. Monsters swing and slide and piggy-back ride. Monsters run three-legged races and fall on their faces. Monsters eat monster lollipops and tussle for the fountain (Gulp...Grrrr...Grumble...Growl...All better now!). In this high-octane sequel to Creepy Monsters, Sleepy Monsters, wild and whimsical artwork revs up a read-aloud text that will have little listeners jumping up to join in the action. It spotlights energetic activity for kids - hot on the tail of the surge of enthusiasm fuelled by the 2012 Olympics. It is an exuberant celebration of being physically active. It chimes with national initiatives to promote healthier life-styles from infancy - miraculously and delightfully making such stodgy-sounding stuff masses of FUN! Jane Yolen, author of the companion book Creepy Monsters, Sleepy Monsters, has written hundreds of books for children and young adults, including the best-selling How Do Dinosaurs Say Good Night? She is the editor of three children's poetry collections: Switching on the Moon, Here's a Little Poem and This Little Piggy. She divides her time between Massachusetts and St Andrews, Scotland. Kelly Murphy is the illustrator of Jane Yolen's Creepy Monsters, Sleepy Monsters. She lives in Providence, Rhode Island.